Eliot imagines sailing wild rivers and discovering giant beasts, right there on his block! But he wishes his adventures were real. Eliot's grandpa, El Capitán, once steered his own ship through dangerous seas, to far-off lands. But he can't do that anymore. Can Eliot and El Capitán discover a real adventure... together? Come find out! All aboard The Greatest Adventure! 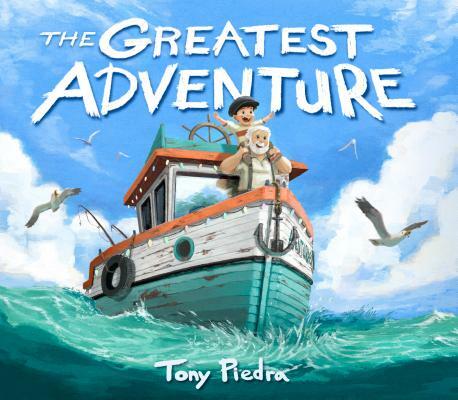 Tony Piedra has been searching for adventure since he could hold a crayon. He has swum with sharks, met wild bears, and sailed to the moon (all without letting go of that same crayon). In between these adventures, he worked at Pixar Animation Studios building 3D worlds for movies like Coco, Up, and Inside Out. The Society for Children's Books Writers and Illustrators (SCBWI) awarded him a Portfolio Showcase Honor in 2014. He lives with his family in Los Angeles. Visit him online at tonypiedrastudio.com.